Alberta Aurora Chasers capture STEVE, the new-to-science upper atmospheric phenomenon, on the evening of April 10, 2018 in Prince George, British Columbia, Canada. Fellow Aurora Chaser Robert Downie kneels in the foreground while photographer Ryan Sault captures the narrow ribbon of white-purple hues overhead. The vibrant green aurora is seen in the distant north, located to the right in the photo. In this issue, Gallardo-Lacourt et al. use a ground based all-sky imager and in situ satellite data to study the origin of STEVE. Their results demonstrate that STEVE is different than aurora since the observation is characterized by the absence of particle precipitation. Credit: Ryan Sault. Thin ribbons of purple and white light that sometimes appear in the night sky were dubbed a new type of aurora when brought to scientists’ attention in 2016. But new research suggests these mysterious streams of light are not an aurora at all but an entirely new celestial phenomenon. Amateur photographers had captured the new phenomenon, called STEVE, on film for decades. But the scientific community only got wind of STEVE in 2016. When scientists first looked at images of STEVE, they realized the lights were slightly different than light from typical auroras but were not sure what underlying mechanism was causing them. In a new study, researchers analyzed a STEVE event in March 2008 to see whether it was produced in a similar manner as the aurora, which happens when showers of charged rain down into Earth’s upper atmosphere. 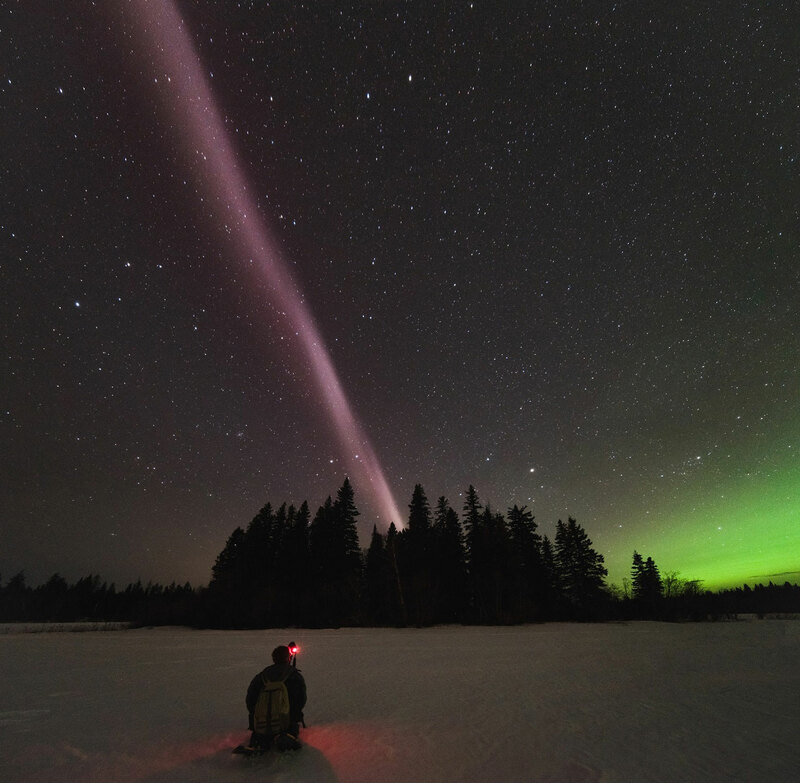 The study’s results suggest STEVE is produced by a different atmospheric process than the aurora, making it an entirely new type of optical phenomenon. The study authors have dubbed STEVE a kind of “skyglow,” or glowing light in the night sky, that is distinct from the aurora. Studying STEVE can help scientists better understand the upper atmosphere and the processes generating light in the sky, according to the authors. Auroras are produced when electrons and protons from Earth’s magnetosphere, the region around Earth dominated by its magnetic field, rain down into the ionosphere, a region of charged particles in the upper atmosphere. When these electrons and protons become excited, they emit light of varying colors, most often green, red and blue. A group of amateur auroral photographers brought STEVE to scientists’ attention in 2016. A Facebook ground called the Alberta Aurora Chasers had occasionally noticed bright, thin streams of white and purple light running east to west in the Canadian night sky when they photographed the aurora. Auroras are visible every night if viewing conditions are right, but the thin light ribbons of STEVE were only visible a few times per year. The light from STEVE was also showing up closer to the equator than the aurora, which can only be seen at high latitudes. The photographers first thought the light ribbons were created by excited protons, but protons can only be photographed with special equipment. The light protons produce falls out of the range of wavelengths picked up by normal cameras. The aurora chasers dubbed the light ribbon occurrences “Steve,” a reference to the 2006 film Over the Hedge. When researchers presented data about the unusual lights at a 2016 scientific conference, a fellow space physicist proposed converting the name into the backronym STEVE, which stands for Strong Thermal Emission Velocity Enhancement, and the researchers adopted it. Where does STEVE come from? Scientists then started using data from satellites and images from ground-based observatories to try to understand what was causing the unusual light streaks. The first scientific study published on STEVE found a stream of fast-moving ions and super-hot electrons passing through the ionosphere right where STEVE was observed. The researchers suspected these particles were connected to STEVE somehow but were unsure whether they were responsible for producing it. After that first study, of which Gallardo-Lacourt was a co-author, the researchers wanted to find out if STEVE’s light is produced by particles raining down into the ionosphere, as typically happens with the aurora, or by some other process. In the new study, Gallardo-Lacourt and her colleagues analyzed a STEVE event that happened over eastern Canada on March 28, 2008, using images from ground-based cameras that record auroras over North America. They coupled the images with data from NOAA’s Polar Orbiting Environmental Satellite 17 (POES-17), which happened to pass directly over the ground-based cameras during the STEVE event. The satellite is equipped with an instrument that can measure charged particles precipitating into the ionosphere. The study’s results suggest STEVE is an entirely new phenomenon distinct from typical auroras. The POES-17 satellite detected no charged particles raining down to the ionosphere during the STEVE event, which means it is likely produced by an entirely different mechanism, according to the authors. The researchers said STEVE is a new kind of optical phenomenon they call “skyglow.” Their next step is to see whether the streams of fast ions and hot electrons in the ionosphere are creating STEVE’s light, or if the light is produced higher up in the atmosphere. Be the first to comment on "STEVE – An Entirely New Celestial Phenomenon"